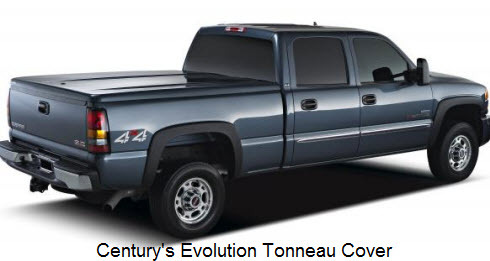 Century Tonneau Covers come in two models, the Evolution and the Cargo Cover. Century Tonneau Covers is a division of Truck Accessories Group LLC of Elkhart, Indiana. They make two tonneau cover models. The Evolution series is a low profile fiberglass truck bed cover with aerodynamic designs shaped into the fiberglass lid. The Cargo Cover series is smooth on top. Both of these hard truck bed covers are made of honeycombed fiberglass, use rotary latches with rods, have a nylon strap for easy closing, have finished edges or painted trim and come with a Limited Lifetime Warranty. By the way these fiberglass tonneau covers weight between 90 - 110 pounds so you want help when you install one. Here’s some features and options for both of these hard tonneau covers. Manufacturer : Century Fiberglass Inc.
Cover Weight : Approx 90 to 110 lbs. Tonneau covers trap moisture inside the truck bed compartment. In fact the more water tight the tonno cover is the better it traps moisture inside your truck. Try using some universal absorbent mats to reduce the magnitude of this problem. They'll also work to protect the mats and carpeting in the cab and reduce smells due to mold and mildew.